Soundminer have announced the release of the revised Soundminer version 5. Soundminer V5 Pro is fully 64-bit compatible now and comes with a new sampler as well as a host of other new features. Reason enough to take a closer look at version 5. 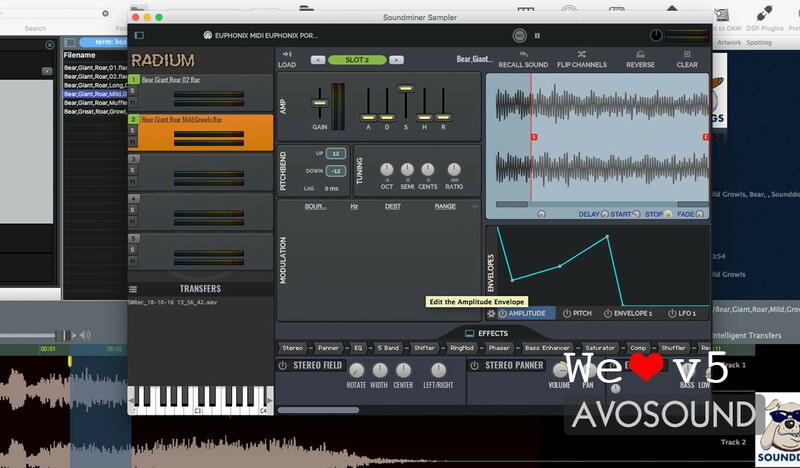 Soundminer Version 5 Pro has just been released as a beta version for testing. To comply with the requirements of current operating systems, Soundminer V5 Pro is now fully 64-bit compatible. This required a lot of changes under the hood of Soundminer V5 Pro, most of which will not be immediately evident to regular users. Reason enough, then, to take a closer look at the latest version of Soundminer. If you would like to get a taste of the updated Soundminer V5 Pro yourself, you can do so here. Please note that you will need a valid Soundminer V5 Pro licence for testing. When you open Soundminer V5 Pro for the first time, you might think you've just opened the old version of Soundminer V5 Pro by accident. This is understandable, as the interface is almost unchanged. However, a quick look at the title bar will tell you that this is indeed version 5. 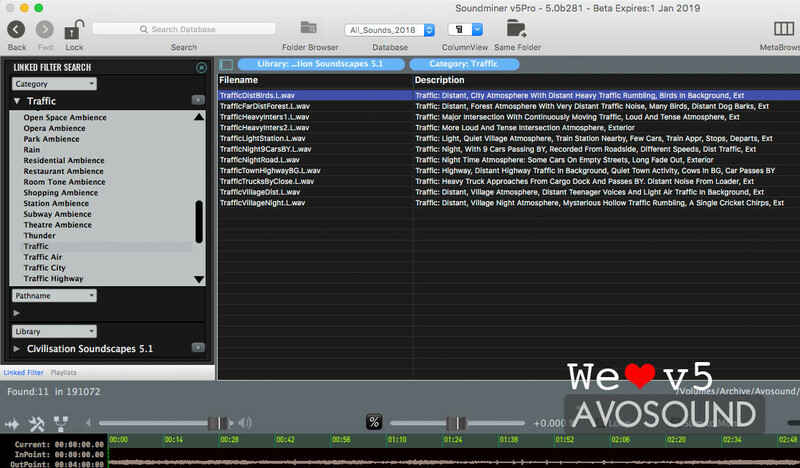 In addition, Soundminer V5 Pro contains new technologies that make Soundminer's source text cross-platform compatible. This is of particular interest to Windows users, because features and functions no longer need to be built twice. While the future direction of this is still unknown, it is definitely good news for Windows users. 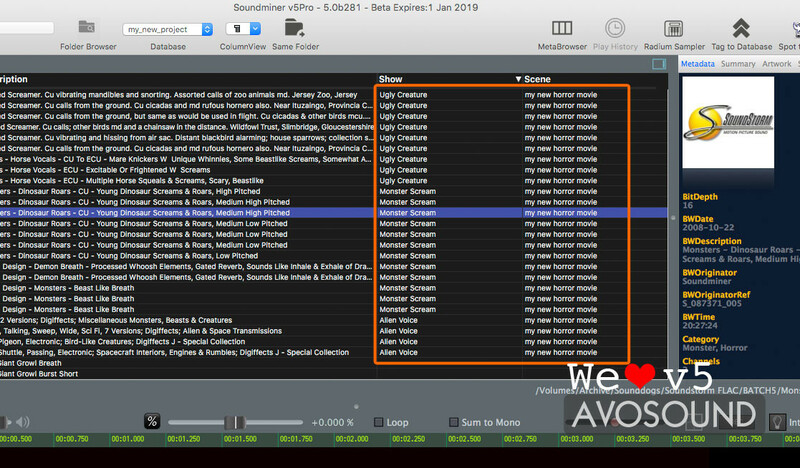 When you open the new version of Soundminer V5 Pro, you will notice right away that all sounds and databases are no longer there. 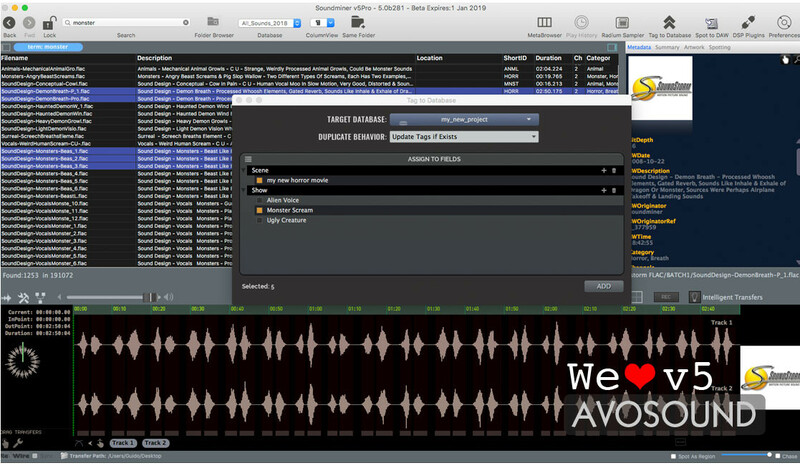 Soundminer V5 Pro uses a new, faster and more robust database in the background. For this reason, database tables from previous versions of Soundminer V5 Pro cannot be transferred and must be set up again. An import tool that works with previous versions is currently in development; it is, however, not yet implemented with the beta version. So if you have been using databases extensively in Soundminer V5 Pro, you will have no other option than to set up your databases again and re-import your sounds. While this might sound tedious at first, it is also a good opportunity to do assess all your stored files and do a 'spring clean'. You will finally get a chance to create a more orderly database structure by throwing out all the old, dusty and outdated databases. At the time of this writing, it is still unclear if existing databases from V4 will be able to be imported into V5. Please check this space regularly for news and updates. This feature will appeal to those who have so far been working with playlists or spotting folders. Tag to Database is a kind of brainstorming feature that allows you to collect sounds for a specific project or purpose. 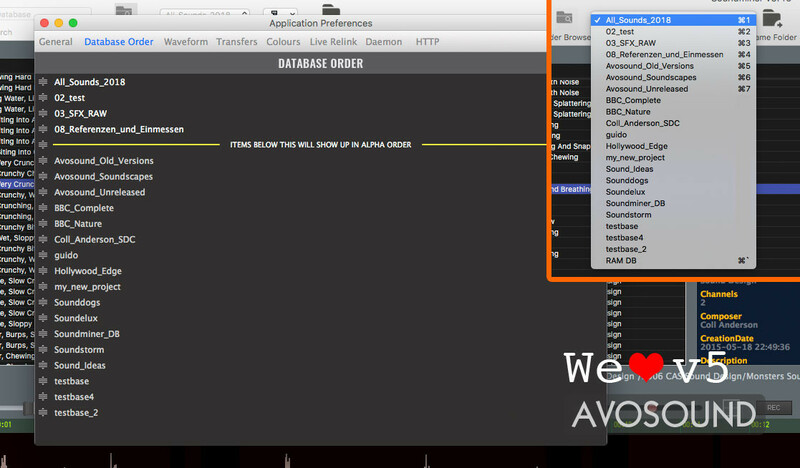 All you need to do is create a new database. If you now search for potential sounds in your archives, you can easily select them and send them to a new 'collection database' via the Tag to Database feature. Later on, you will be able to work with this selection without having to drag around 100,000 other files. When you access the new database, you will see the collected sounds with the project tags - ready for further selection or arrangement. The new Radium sampler is easily one of the most remarkable novelties in Soundminer V5 Pro, bound to make every sound designer's heart beat faster. Clearly, the developers put a lot of hard work into this tool. The Radium sampler sports all the features a sound designer could ask for - including direct import from your sound archive so you can play around and/or create new sounds. 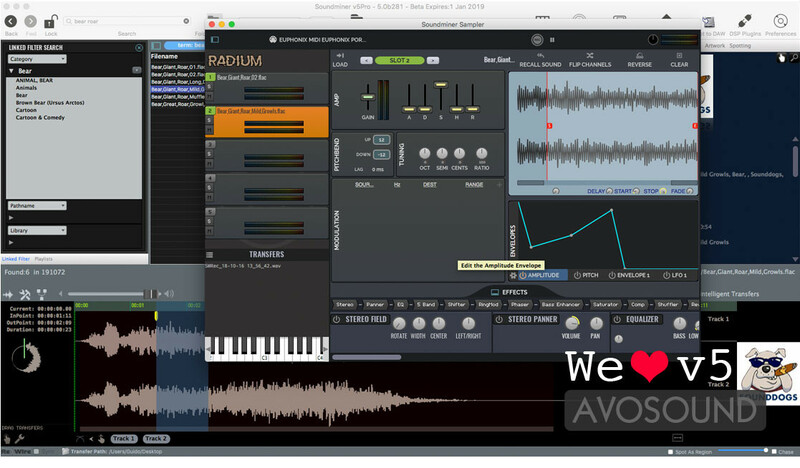 -With Soundminer V5 Pro you can import into the Radium sampler directly from the Soundminer browser with one click. -There are 5 sampler slots (i.e. 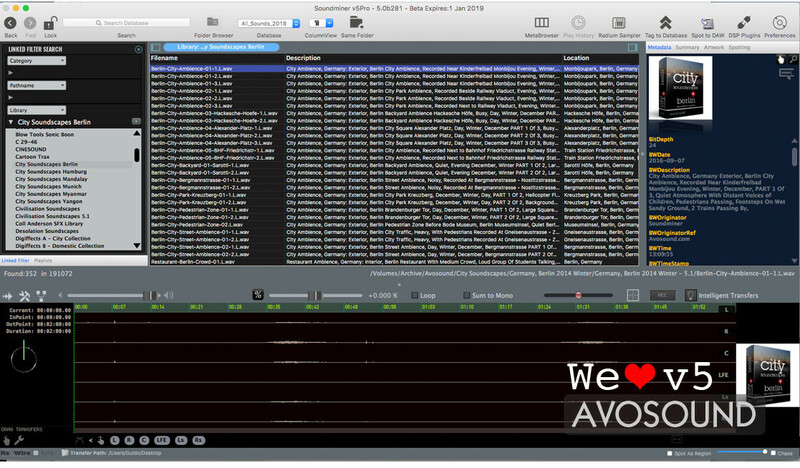 audio tracks) available that can process sound material independently of each other. Each sampler slot contains all necessary parameters that are required for sound design work: slowing down sounds (or speeding them up) over several octaves; a fine-tuner; envelope and envelope curve processing; level and gain functions including attack, sustain, release values; a modulator as well as lots of built-in effects like compressor, bass enhancer, shifter, phaser... Whatever you desire! When you are happy with your new sound creations, you can use the Radium sampler's record button to save your new sounds as audio files. These files are just regular audio files that can be tagged with metadata and imported into your projects. Yep, that's also possible. Or let's just say that it's in the works. The Soundminer V5 Pro Beta Version b310 allows for the first time to save your radium settings. With Soundminer V5 Pro it is possible to include Audio Unit Plugins. This will appeal to those who use this format in editing software other than AVID. 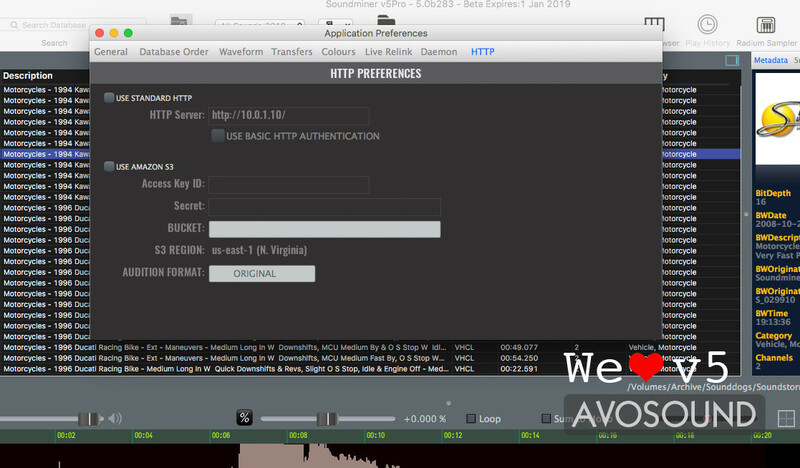 Now possible with Soundminer V5 Pro! To load your sounds into the cloud, you need to open an Amazon S3 account. Amazon will charge a monthly fee based on your storage requirements. We will soon post a tutorial about how to connect your Amazon S3 account and your bucket to Soundminer V5 Pro. If you would like to test Soundminer V5 Pro, please get in touch here. Send us an email with your iLok ID. Please note that you will need a valid Soundminer V4.5 Pro licence to test the new version 5. 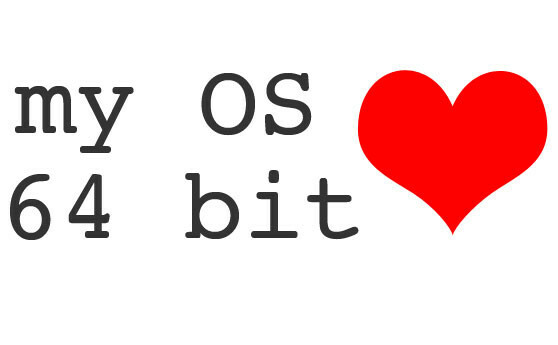 We are happy to let you try out version 5 until May 1st, 2019. 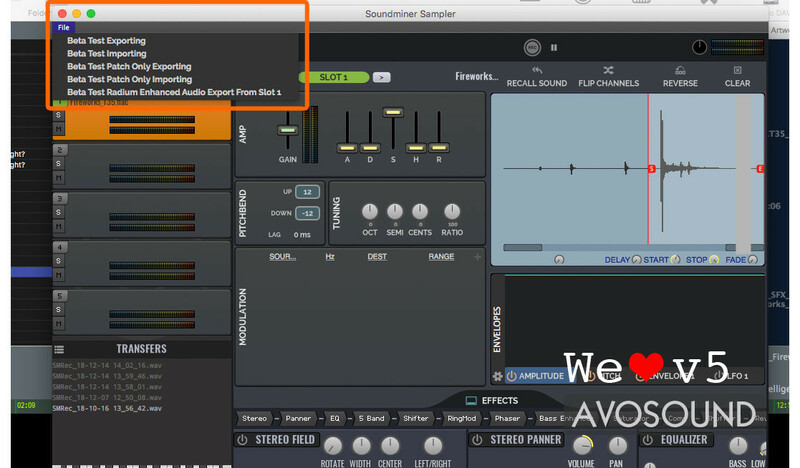 This wraps up our little intro to Soundminer V5 Pro. Please click here for more news and info.